Martine, thank you for introducing me to her work. This is a beautiful poem and very true! It is one of the hardest things to let go of someone you love when the time comes to do so. 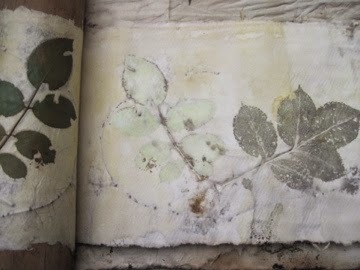 I was just looking at your photo and was wondering if the leaves are pressed into fabric or paper? It looks like white felt. Love the effect! It was great to stop by and read this poem and to see your work. zoals mary schrijft is het ook, maar dat is niet altijd even simpel, eh! Een mooi gedicht Martine ,maar niet zo eenvoudig. mooi wat je met de herfst blaadjes kunt doen.